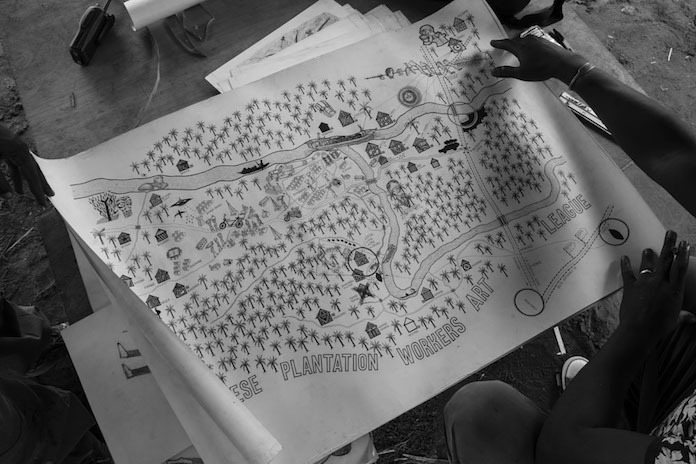 This foundational conversation on the Cercle d'Art des Travailleurs de Plantation Congolaise (CATPC) will provide an overview of the activities of CATPC and their collaborators in the Congo and within the international contemporary art world. Looking closely at the works of individual artists in the group, panelists will address the stakes of self-representation in works of art made by CATPC members and their economic implications, notably with respect to the methods of production, circulation, and publicity that are integral to the meaning and reception of the works. Topics will include the history of plantation economies and their role today, the potential of art for social and economic change, institution building and collectivity, and the politics of representation. Conference participants include: Ariella Azoulay, Brown University; Simon Gikandi, Princeton University; Eléonore Hellio, CATPC; David Joselit, The Graduate Center, City University of New York; Mathieu Kilapi Kasiama, CATPC; Ruba Katrib, SculptureCenter; Renzo Martens, Institute for Human Activities; and Michael Taussig, Columbia University. This program is free and open to the public but advance registration is required.